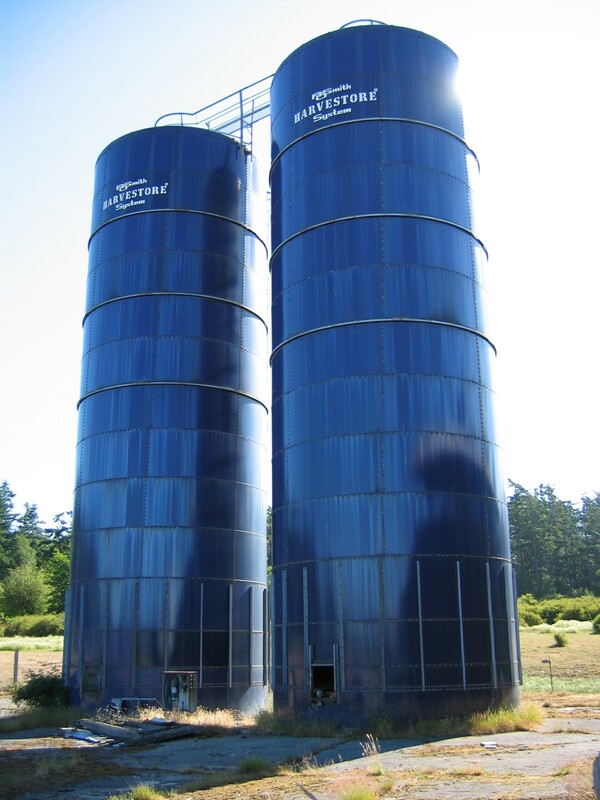 Silos are a relatively recent farm building form. Experimentation in Europe in the 1870s with the preservation of green fodder—called “ensilage” or simply “silage”—led to its adoption in the US, first in the Midwest and then later in the New England/New York region. By keeping the fermented contents (silage) in a low oxygen environment, they prevented mold or decay and preserved the nutritional value of the fodder. Farmers discovered that feeding milch cows silage kept them “fresh”—still producing milk—during the normal off-season of late fall and winter. Silos varied a lot in form and construction. Early versions in the Midwest and New England/New York were lined pits. 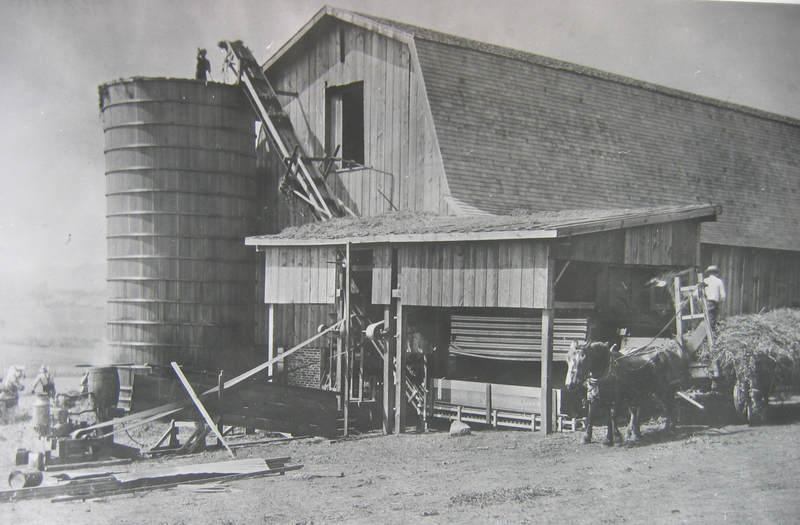 However, farmers soon learned the advantages of vertical or “tower” silos—the downward pressure of the silage compacted itself, thus leading to less air pockets that produced spoilage. 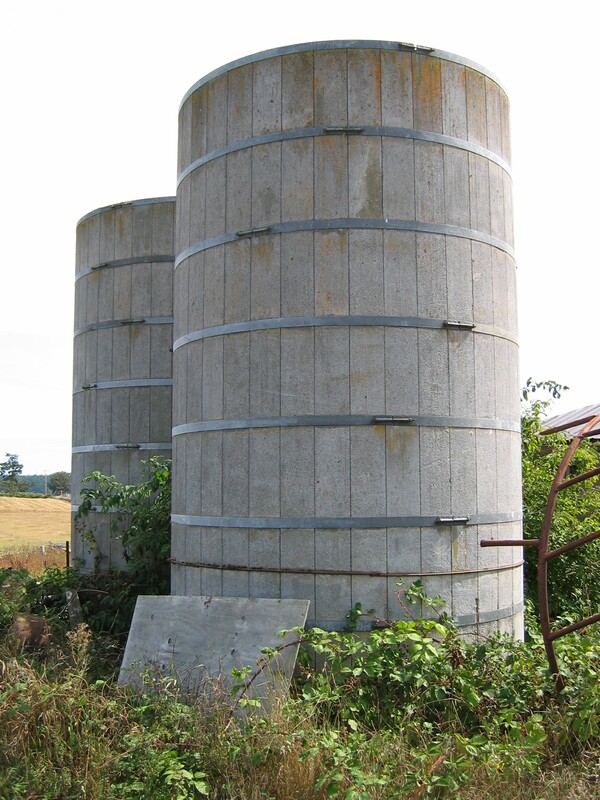 Changes in design reinforced these advantages: tower silos were originally rectangular, but round models—originally with horizontal bands, later with vertical staves like a water tank—eliminated corner pockets of air and withstood the outward pressure of the weight of the silage. When they were placed on concrete foundations with floors, another problem was eliminated: rotting wooden foundations. Round tower silos were also constructed of concrete or structural tile blocks. These ranged from 12-14’ in diameter and rose to 35-40’ in height; it was estimated that a 12’x38’ or a 14’x30’ silo would serve about 25 cows. In 1905, the S.T. Playford Company of Elgin, Illinois developed silos constructed of “cement” (technically, concrete) staves. These became the most common survivors in the islands. The staves, 10” wide by 30” tall and 2½” thick with V-shaped mortise and tenons on alternating edges, interlock to form a uniform cylindrical tower, commonly 10’ in diameter. The staves were alternately overlapped a few (2) inches vertically, and steel hoops (3” wide) or ½” metal rods that covered these were tightened to ensure a tight, integral structure. The inside was plastered with a thin cement stucco or wash to create a smooth, airtight surface. These silos were approximately 12 staves or 30 feet in height, and were capped by a frame gable or hipped roof covered with shingles. Farmers had to climb up a ladder on the side of the tower in order to empty out the silage from the top down; a series of air-tight 20”x30” doors were placed in the openings down one ‘side’ of the silo. In 1945, the A. O. Smith Company developed the “Harvestore”, which featured fiberglass bonded on the inside to the metal container. The Harvestore was 20 feet in diameter and 61 feet high, painted a distinctive blue, and featured a system of unloading from the bottom of the silo. In addition to their better performance, however, they were more expensive: in the 1960s, for instance, a Harvestore cost $11,302, twice the $5,435 for a concrete stave silo.